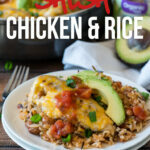 Salsa Chicken Rice Skillet is a complete meal made with organic ingredients, in just one pan and in less than 30 minutes! Last month we moved to a new house, same town, just a little bit bigger of a house in a quite neighborhood. One of my favorite things is that we are now less than 5 minutes away from a Walmart, so if I need anything, it’s just a quick trip down the road. 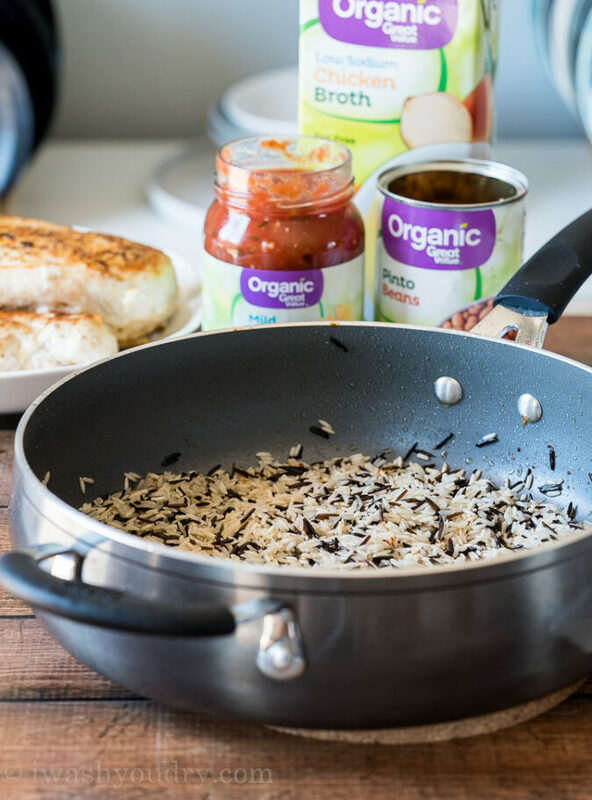 I’ve partnered with Walmart to create this ultra easy and affordable dinner recipe featuring their Great Value Organic line of products. There is a wide assortment of Great Value Organic products at competitive prices too! 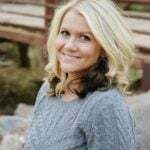 I was able to pick up all the organic ingredients I needed right at my local Walmart, but they also have a big selection online that you can easily order. 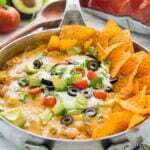 I use Great Value Organic Pinto Beans in this recipe, but you can substitute for your favorite variation of bean. 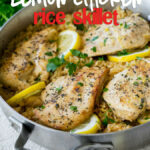 Try adding in a can of whole kernel corn with the rice. Substitute 1 lb. ground beef for the chicken breasts. Add in a 4 oz. can of diced green chilies or jalapeños for a little extra kick of heat. 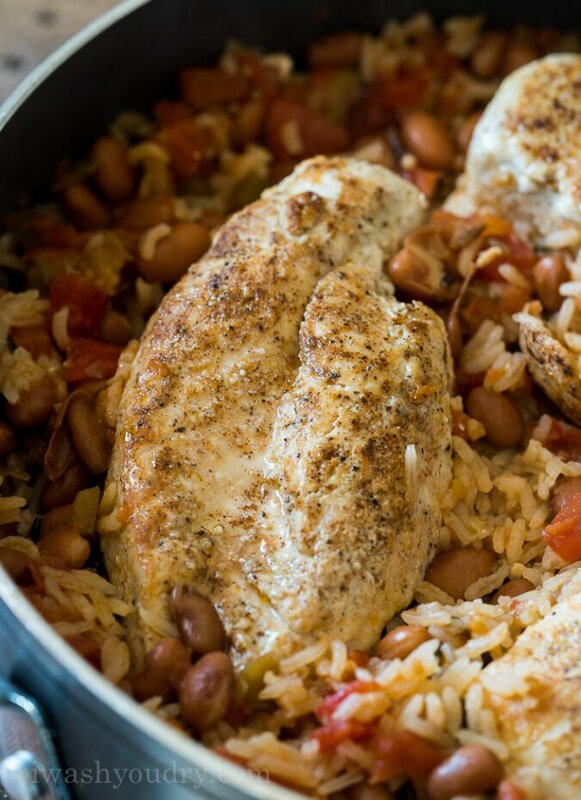 Add some Great Value Organic salsa, chicken broth, lime juice, beans and garlic salt to the skillet with the rice and bring it to a boil. Nestle the chicken breasts back in the skillet, reduce the heat to a simmer and then cover. Let the rice cook until it’s tender and fluffy. Keep in mind that this is a combination of long grain rice and wild rice. Wild rice will have a different texture than the long grain rice, so you’ll have a fluffy long grain and a slightly al dente wild grain. I love the combination of the two together! 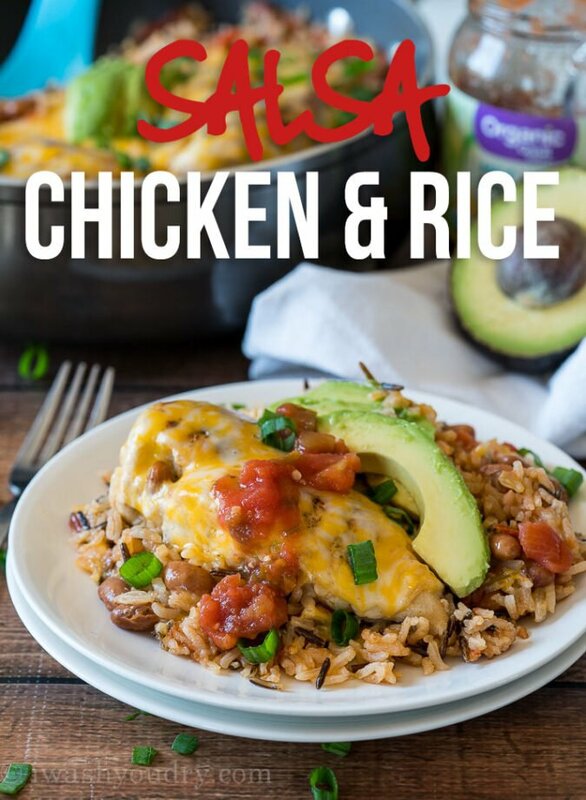 Once the rice is fluffy, you’ll top with some marbled cheddar cheese and cover until it’s melted. Add some organic sliced avocado, more salsa and diced green onions on top! 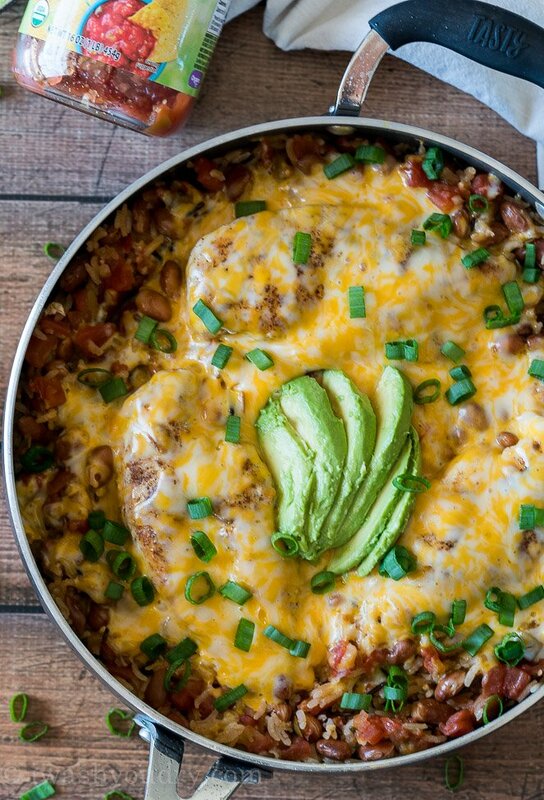 It’s a gorgeous meal that comes together in less than 30 minutes. 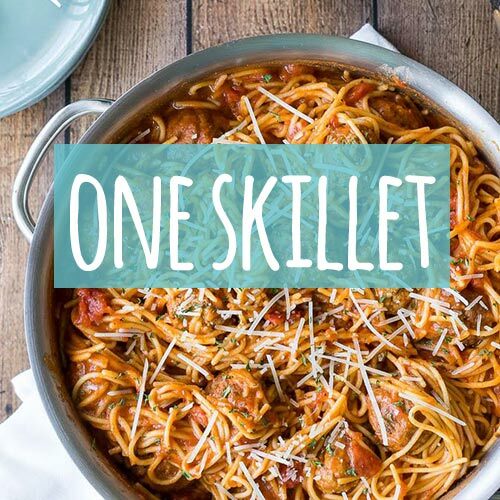 Your family is going to love this complete meal, and you’ll love being able to feed your family quickly with quality organic ingredients easily found at Walmart! 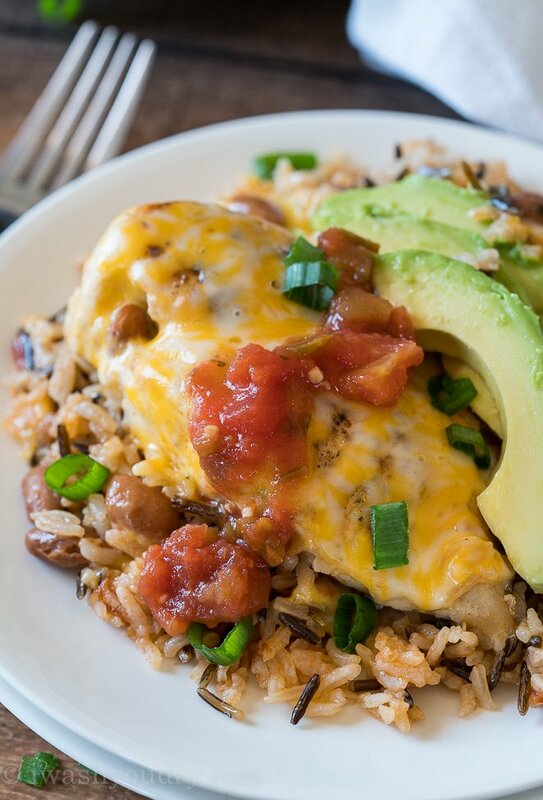 This super easy and Cheesy Salsa Chicken Rice Skillet is filled with organic ingredients and ready in less than 30 minutes! Season both sides of the chicken breasts with garlic powder, chili powder, cumin, salt and pepper. 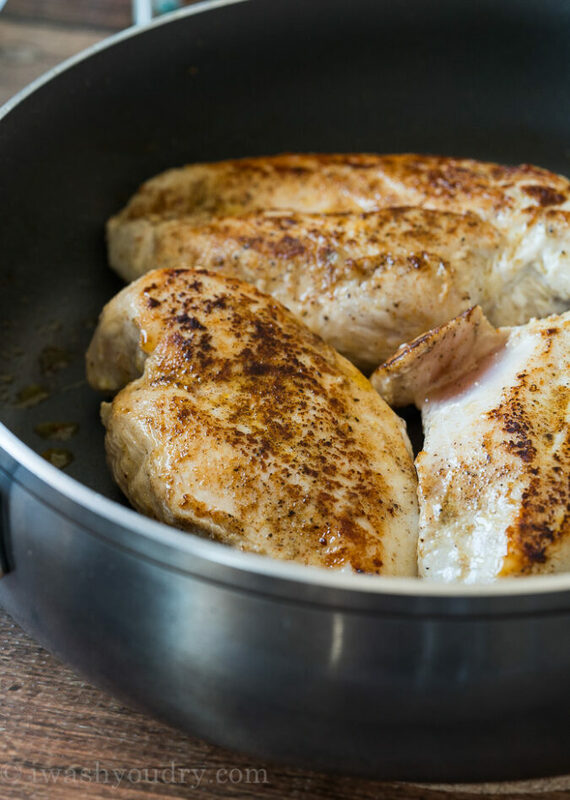 Heat a large skillet over medium high heat and add 1 tbsp of the Great Value Organic Extra Virgin Olive Oil. Sear the chicken for 3 minutes per side, until golden brown (the chicken wont be cooked through at this point). Remove from the skillet and set aside. To the skillet add 1 tbsp butter and the remaining tablespoon of Extra Virgin Olive Oil. Add in the Long Grain and Wild Rice blend and stir, toasting the rice slightly. Add in the garlic salt, lime juice, chicken broth, salsa, and drained pinto beans. Bring the mixture to a boil, then nestle the chicken breasts back on top of the rice mixture. 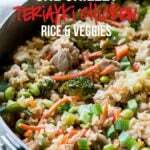 Reduce heat to a simmer then cover and let cook for 15 minutes, or until the rice is tender and liquid is absorbed. Remove the lid and cover the chicken breasts with the shredded cheese. Place the lid back on and let the cheese melt. Top with the sliced avocado, extra salsa and diced green onions. Enjoy! I live in the Netherlands, here you can’t find pinto beans. So I’ll use black beans instead. 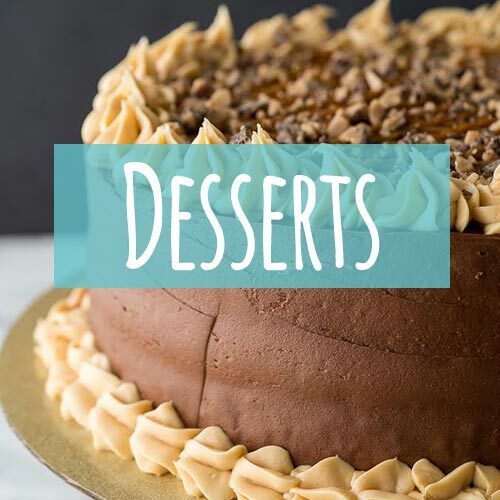 Made this tonight…. and it was Amazing!!! Absolutely loved it!! I have a big family and had to triple the recipe. Everyone loved it! Thanks for sharing this one! What is the nutritional value of this lovely dish? I would like to know nutritional value also.. these dishes look so good.. but values would be so appreciated. Hi Shawn, could I sub a long grain white rice (like basmati) for the wild rice blend? I just don’t love the texture of wild rice. This looks good and easy to make but I will have to forego the organic part and use regular stuff for now. 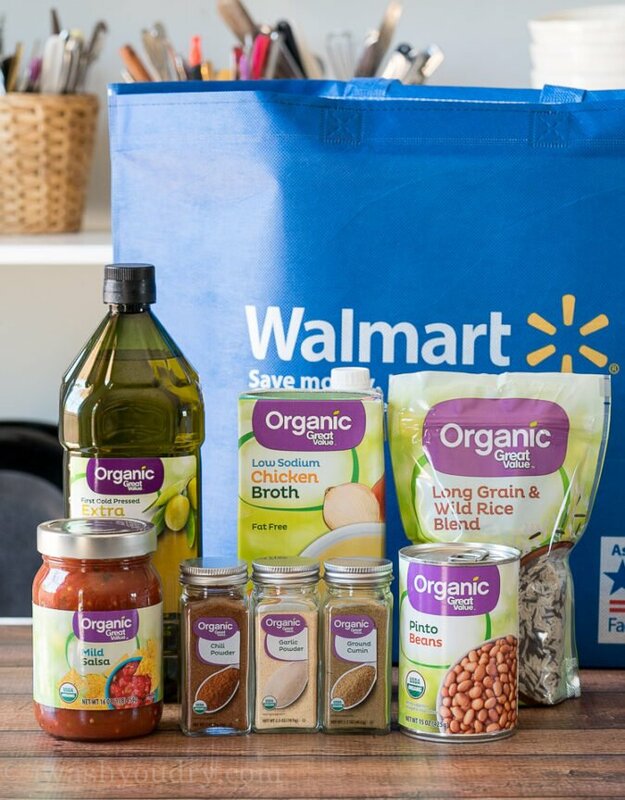 You’ll be pleasantly surprised at how affordable the organic line is at Walmart!